The Valentine’s Day that my son was two years old, I decided I’d attempt to bake and frost heart-shaped sugar cookies to send with him to Mom’s Day Out. I wanted to be one of “those moms”—moms who sort of breeze into the room airily with a plate of fresh-baked goods and wave off compliments with, “Oh, it was nothing, really. Just whipped these up in a flash.” And mean it. However, I am not one of those moms. Baking is a chore for me, and most often times, a near disaster. 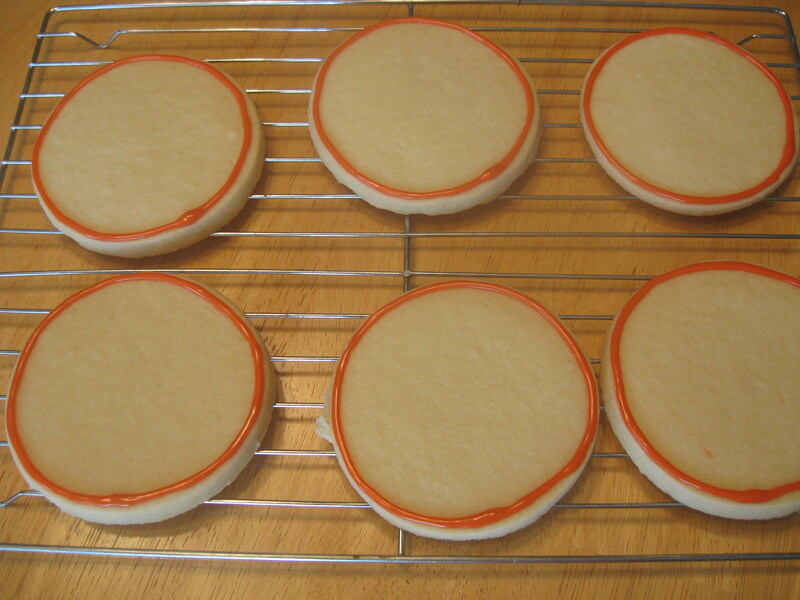 But really, how hard could sugar cookies be? Apparently, much harder than I anticipated. Oh, the cookies tasted fine. They were totally edible, as long as you looked past the appearance of a shapeless blob that was supposed to be a scalloped heart. And the powdered sugar icing that I made so often as a child (okay, my mom made it, maybe that was the difference) ran off the cookies in a dripping, messy ooze that caused me to throw the entire batch into the trash and declare myself a complete failure. It was an embarrassment, truly. I’d show you pictures, but fortunately I had enough self-preservation to know better than to take any. By fall, I decided to give it another whirl. And while I am not nearly as talented as Bridget at Bake at 350, my technique has definitely improved. I’ve since taken cake and cookie decorating classes…and while all the instructors advised using royal icing that for the prettiest cookie, I’m here to tell you – don’t. Well, unless you actually like royal icing, that is. Then go for it. Personally, I like my cookies to look pretty and taste yummy, and not have to worry about cracking a tooth on the cement-like hardness you’ll find with royal icing. This icing is probably very similar to the powdered sugar icing we made as kids, with a bit of corn syrup added in to give them a slight sheen. In a large mixing bowl, whisk together powdered sugar and milk until smooth. Add in corn syrup, and 1 ½ teaspoons almond extract. You can use vanilla extract if you wish; but almond really tastes the best here. 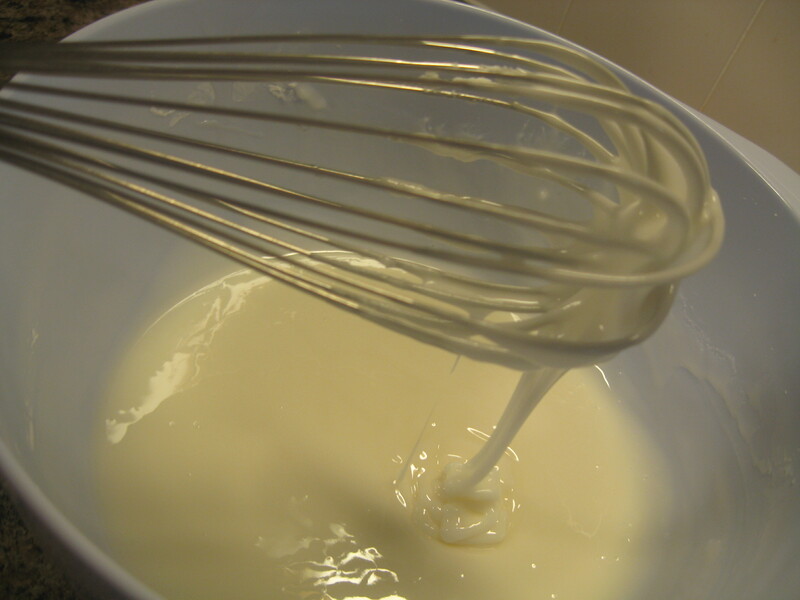 With a strong arm, whisk together until the icing is shiny and smooth and drizzles off your whisk easily. The consistency you have at this point is what you’ll use to fill your cookies. But unless you thicken some up first to use as a dam, you’re going to be left with a runny mess everywhere. Trust me on this; I have plenty of experience. 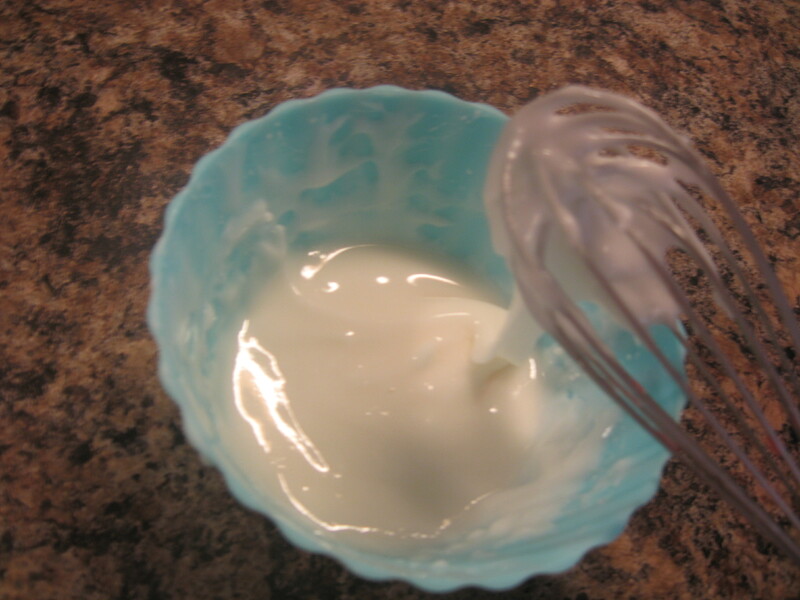 Using a small bowl, pour in a bit of your thin consistency icing. Sprinkle in some additional powdered sugar and whisk again, until smooth and difficult to mix by hand. It’s going to look thick—this is a good thing! 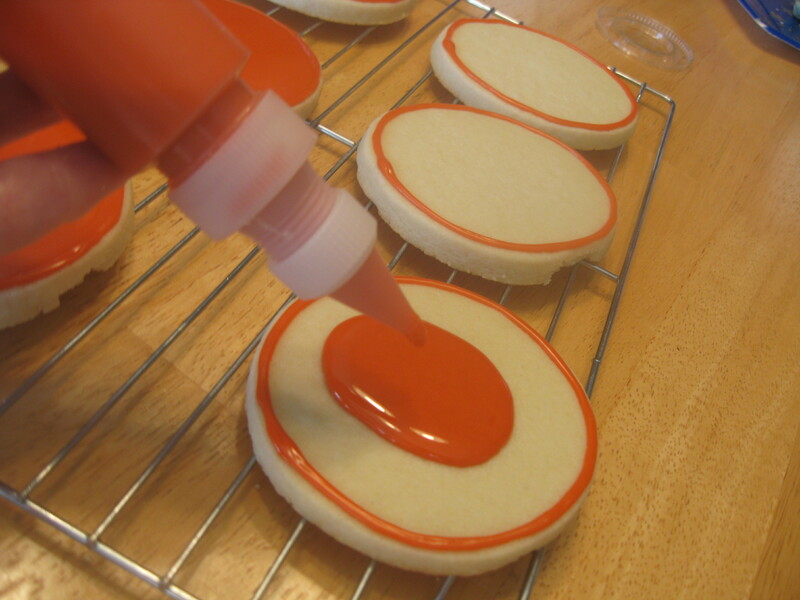 Carefully squeeze your thin consistency icing onto your cookie. Do not be tempted to immediately fill in every gap and cranny. This icing is runny and will spread—if you squeeze too much on, there is no dam in the world that can save you from overflow. Again, just trust me. It’s really best to let these dry for a few hours before decorating, but I usually don’t have that much patience. I pop them in the refrigerator for a about 30 minutes and then get started. If they are dry to the touch, you should be good to go. Again, using your thick icing and a #3 or #4 tip, add your decoration or embellishments. I’m making a fairly simple design here, but you get the idea. Let your cookies dry overnight before stacking. They will eventually harden, but not quite as hard or as quickly as royal icing will. If you really want to look professional, package these in clear cellophane bags and tie with coordinating ribbon. 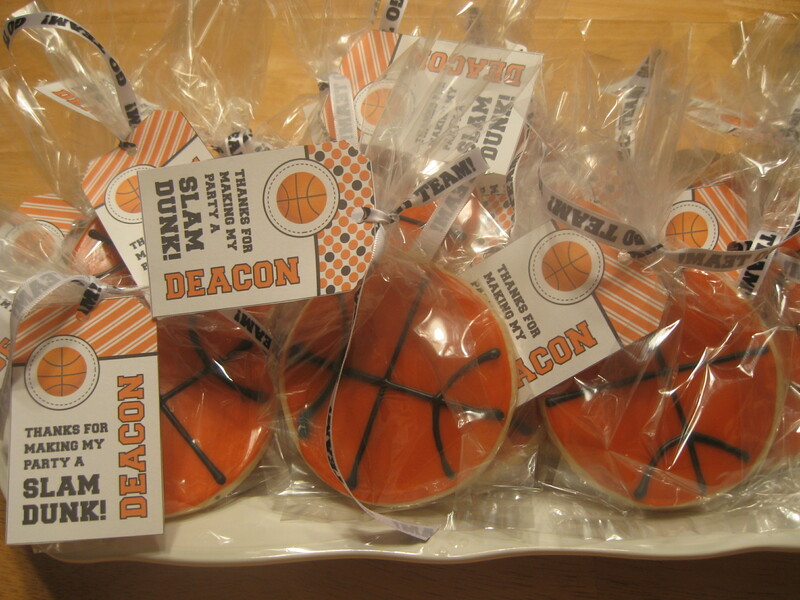 Since I made these for party favors, I added goody-bag tags to mine, designed by Chickabug. I love how thourough you are & the photos you posted. I was wondering is there something I could use, in place of the almond extract? I really don’t like that flavor much. Or, if it is left out, should I add more milk to replace the liquid content? I am hosting a cookie decorating party next weekend & can’t wait to try this out this week! Renatta, you can replace the almond extract with any flavor you like. Vanilla is great, and peppermint is fun for holiday cookies. 🙂 Have fun decorating! 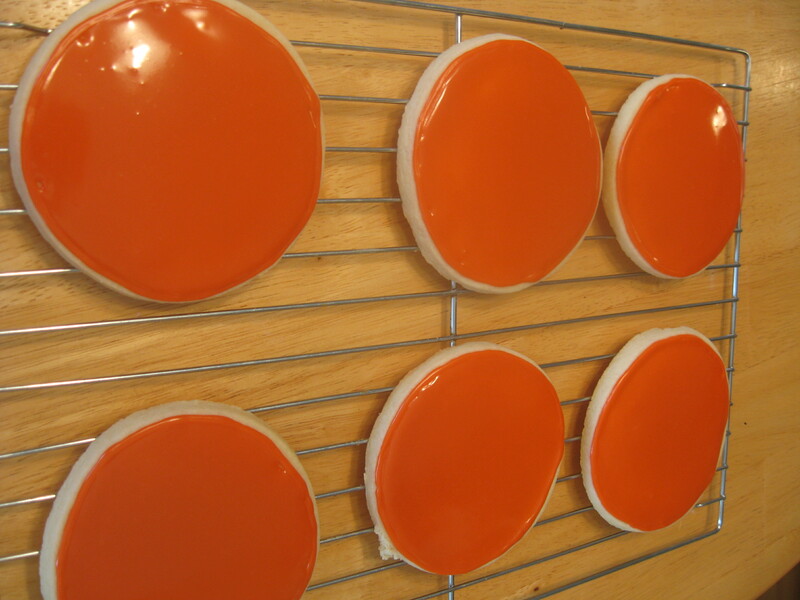 I bake a lot of cookies and always use a glaze like this recipe and I love the taste however, I have the same problem as Javene above….after a few days colored cookies have that white cloud effect that she mentioned. Any ideas on what I am doing wrong? I have been reading about icing cookies and I also don’t care for the taste of royal icing. My question is the use of milk. My question may be silly but does the milk go sour that is used if these are done ahead of time. I like to start decorating cookies and it takes about 10 days to get them delivered to my friends and family. Thanks for helping me out! I use water instead of milk and leave them out of the refrigerator. Mine only get hazy when I put them in the fridge. I made your cookie icing recipe for an impromptu family dinner at my house last weekend. It was one of those recipes I had pinned on Pinterest to try at some unspecified future event. Well, it was Perfect! It is a very forgiving recipe also because I’m sure in my haste I was not as exact as I should have been but it still set up nicely and tasted wonderful. Like you, I’m not a fan of the royal icing most bakers recommend for cookies, but I’d like my cookies to still be pretty. This was just the thing. Thanks for sharing! Could I add a tablespoon meringue powder to the corn syrup icing to help with keeping design shape and drying quicker(or would it?). Or would it still dry too hard? I like your blog. Thanks for the icing recipe. Please post more pictures of your cookie decorating. What do i do about those white spots on my iced cookies? Excellent recipe! Icing tastes and looks great! Thanks for sharing! I had used a modified version of this recipe and always had to tweak it. It is perfect as-is for filling the cookies after the outline is done! I use a pancake pen (google it-amazing device) to “fill” the cookie up after the outline. Thank you, thank you! What can you substitute corn syrup with? I don’t want to use corn syrup either. I’m wondering if a simple syrup (sugar and water) would work. If I cant find corn syrup in our town, what aletrnative can I use? Corn powder? 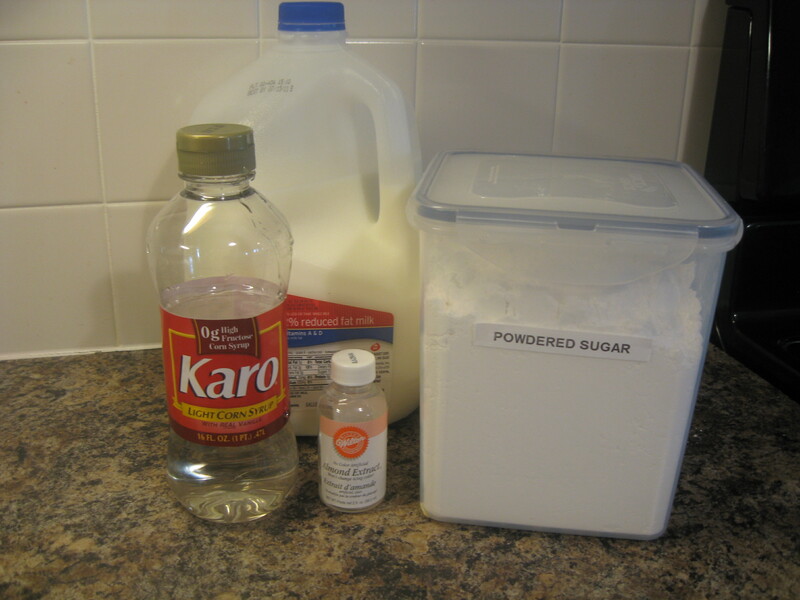 Look for corn syrup near the regular pancake syrup and in the baking aisle. It keeps the icing from getting rock hard and it gives it a shine. Karo is the brand I use but in a pinch, I would probably use a tiny bit of pancake syrup. Not real maple syrup. General pancake syrup is mostly corn syrup with imitation maple flavoring. If you use sparingly, you won’t be overwhelmed with maple flavor. Also try agave nectar it’s near the sugar isle. 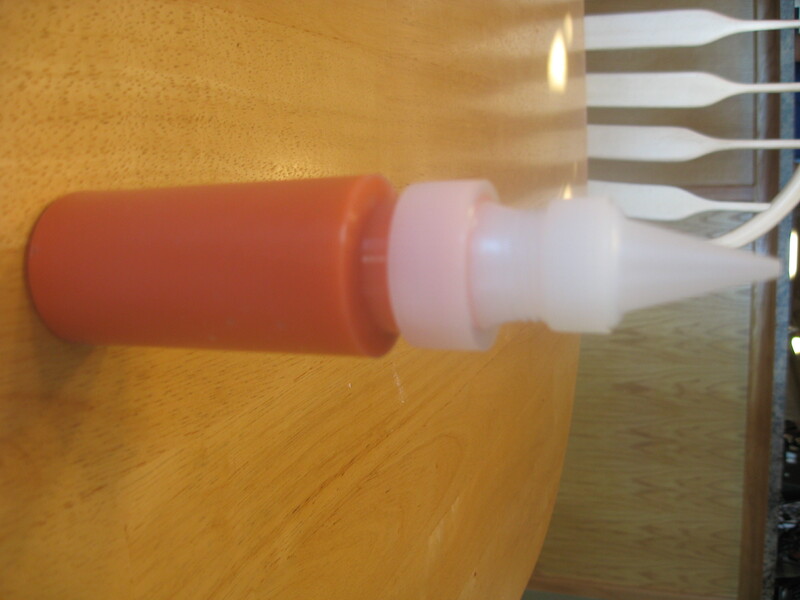 It’s thick like corn syrup. Only thing is it may tint the white color of the frosting a tiny bit but should be fine after coloring. If it’s too think try thickening with more powdered sugar or a pinch of corn starch. Can vanilla extract be used rather than the almond extract? I’m not a fan of almond extract, so I use a few drops of butter flavoring, a few drops of clear vanilla extract, and only a few drops of almond extract. I keep adding drops until I get the flavor I like. It’s awesome. I just tried royal icing today and yuck on the taste. I was grateful to find this and will try in the future. I have a question. I wanted to make black frosting today as the primary color but my son tried one with just a small amount and his mouth turned black. Not good for cookies going to a conference. Does anyone here have a fix for this? Thank you for the recipe. It looks like most people love it. But before I make it, I need to know if there is a solution to the “white cloud” folks are asking about. 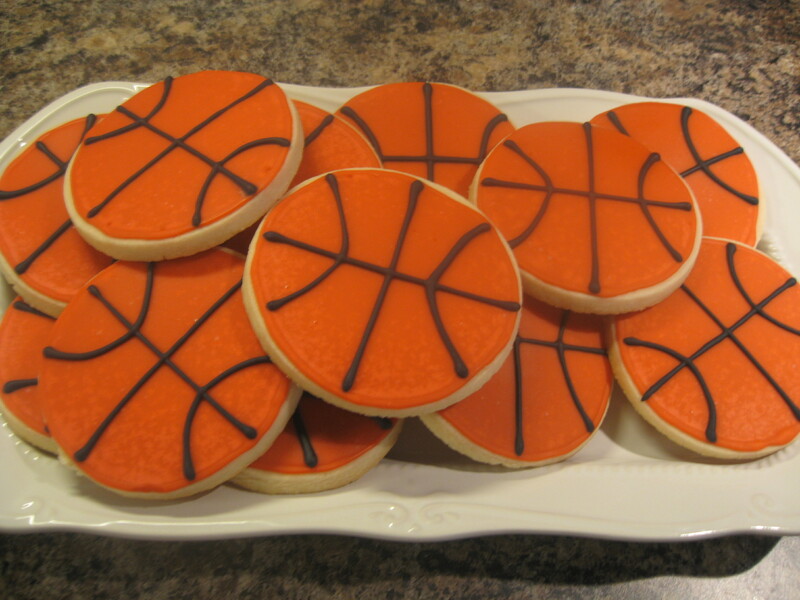 I need to make these cookies in advance of distributing them and they need to look good as well as taste good. Please advise. Thanks. Can someone tell me approximately how many cookies this recipe would ice? Thanks!